This is not always as simple a question as it initially seems. There are many different models of stepladder on the market, each designed for a subtly different range of purposes. Before purchasing a stepladder it is worth pausing to consider exactly what your particular needs are and then looking for the tallest within the appropriate category. The homeowner looking to carry out minor interior decorating or maintenance jobs will have a very different set of requirements to one with a large outdoor area to maintain, with uneven work surfaces and tall trees or hedges to prune. Stepladders are a favourite choice of many homeowners due to their versatility and ease of use. The increased area of contact with the ground gives a far more stable work area, especially in the case of models with stabiliser bars at the base. Their freestanding construction allows greater reach, particularly with double sided stepladders where the rungs on either side allow for work in 360 degrees without the need to move or re-erect the ladder during work. As they fold flat when not in use, stepladders are easy to store and transport and easy to erect and dismantle if working alone. Combination stepladders can also be opened out to form a straight one piece ladder for work at greater heights. Working environment – If working indoors, a basic ‘A’ frame stepladder can often be all that is needed as you will be working on a solid, level ground surface performing relatively straightforward tasks. However, if working on stairs, adjustable combination ladders could be a better choice. When working outdoors, other factors must be considered such as wind or uneven and soft ground surfaces. Cost – For most homeowners, budget is a major factor to consider. The more specialised and complex a piece of equipment is, the higher the price. Function – For basic, everyday tasks a simple model of stepladder is all that is needed, but many users will need equipment that can be used for a variety of different jobs. For more specialised jobs such as fruit picking or groundskeeping a more specialised model like a tripod ladder may be best. If the work involves extended periods on the ladder, a platform stepladder can offer greater comfort and manoeuvrability. 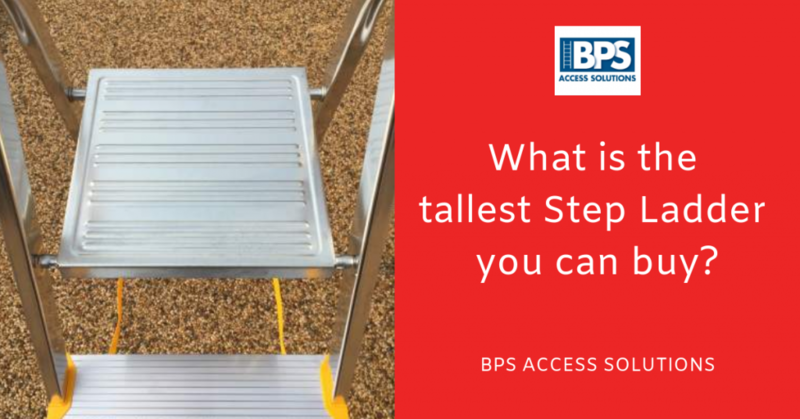 BPS Access Solutions has a large range of accessories and ladders to suit all jobs and we will now discuss the four models of stepladder in our range with the greatest height for their design. Each has their own strengths and suitability for a particular range of tasks. Trade platform stepladder – This is a single sided basic ‘A’ frame stepladder with a large non slip platform at the top that folds down when in use to give a stable place to stand while working. The front section also has a high hand rail at the top. When working further down the ladder this can be gripped for added stability or if standing on the platform it will stop the user moving too far forward and falling from the platform. The largest model has eight wide non slip rungs and a platform height of 1.62 metres, giving a working height of 3.12 metres. For most interior decorating or maintenance jobs, this should allow the user to reach the tops of walls and ceilings easily. Three section combination ladder – This model has a similar design to the two section ladder above, but has an additional second extension. This allows it to be set up as a shorter two sided stepladder in the same way as above or the second sliding section can be extended to give an inverted ‘y’ shaped ladder. This greatly increases the height and with the largest twelve rung model gives a full height of 5.41 metres. Again, this gives all the benefits of a freestanding ladder, but the additional height increases its usefulness for jobs such as gutter clearing and repair. Due to the three part construction, this model is very compact when retracted and vey easy to store. Adjustable tripod ladders – these come in two designs, one foot and three foot. Both have a very wide based ladder section and a single leg that folds out to make a tripod. This gives a wide triangular footprint for greater stability and causes little disturbance to flowerbeds or similar delicate locations. The feet of the ladder are equipped with wide clawed feet to grip securely to the ground although these can also be fitted with rubber covers to avoid damaging other surfaces. In the one foot models the base of the ladder section is fixed and the leg can be adjusted in length for work on uneven or sloping terrain. The three foot model also allows the height of the feet on the ladder section to be adjusted to fit any terrain. This type of stepladder is perfect for fruit picking or tree pruning as the single back leg allows access right into the crown of a tree. They are also very useful for repairs or similar work in tight corners and the platform and guardrails at the top make them very comfortable and safe when working for extended periods of time. The largest one foot models have a maximum working height of 4.2 metres whereas the largest three foot models have an even greater working height of 5.5 metres. All of the stepladders discussed above are manufactured from hardwearing and non–corroding Aluminium making them light and easy to use even when working alone. This also makes them easy to transport and store away after use. All our products are rigorously tested to conform to the latest safety standards and come with a full lifetime guarantee. We offer free next day delivery and check our prices daily against our competitors to ensure value for money and top quality for all our customers. For further information please visit our website or contact our expert sales team who will be happy to discuss our products or offer any advice or recommendations you may need. PreviousWhat is a combination ladder? NextWhat is an extension ladder?